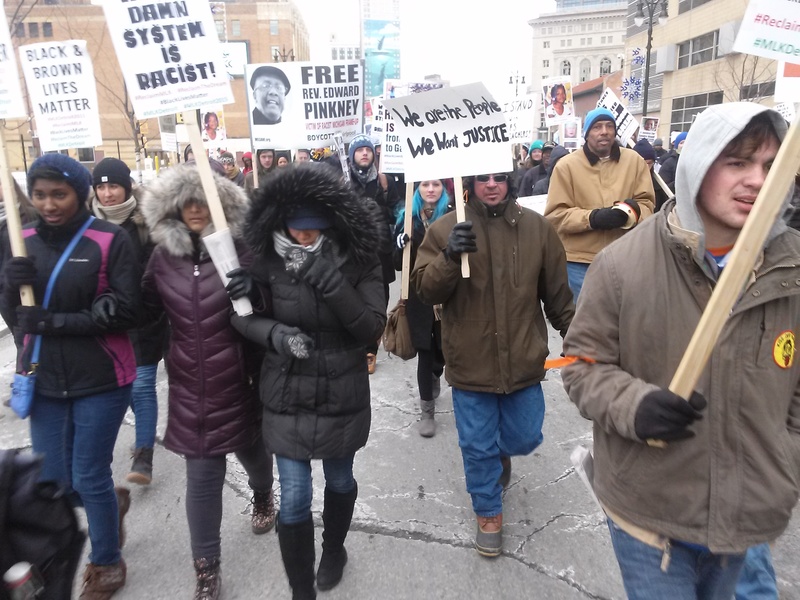 On Monday January 18, the MLK Day rally and march took place in downtown Detroit where a host of speakers and organizations participated. Despite a wind chill factor below zero, the sanctuary at Central United Methodist Church was filled with activists who work consistently for social justice and peace throughout the state of Michigan. This is the same church where Dr. Martin Luther King, Jr. spoke on numerous occasions during the 1950s and 1960s. King delivered his annual Lent sermon at the facility on March 14, 1968 just three weeks prior to his assassination in Memphis, Tennessee on April 4. The special guest for the 2015 gathering was Pastor Cori Bush of Ferguson, Missouri who traveled to Detroit and Toledo, Ohio to bring news about the ongoing movement in St. Louis County which woke up the United States and the world in 2014, exemplifying the reality that the society is by no means free of racist violence and state repression. Bush is a healthcare professional and a clergywoman who experienced firsthand the utilization of police violence against the people of Ferguson in the aftermath of the law-enforcement killing of Mike Brown on August 9, 2014. Other speakers were invited including Mrs. Dorothy Pinkney, who as a result of the inclement weather was not able to drive over 200 miles from Berrien County. Nonetheless, she sent a statement that was read by Marcina Cole, a leading organizer in the Detroit area campaign to win freedom and legal vindication of Rev. Edward Pinkney, Michigan’s political prisoner. Rev. Pinkney was railroaded in the Berrien County courts during 2014 on fraudulent felony charges of changing five dates on recall petitions aimed at the removal of Benton Harbor Mayor James Hightower. During the course of the trial there were no eyewitnesses presented by the court that testified to the actualization of the alleged crimes. The political activities of Pinkney and his associates were introduced as evidence by the Berrien County prosecuting attorney Michael Sepic. Pinkney is the leader of the Benton Harbor Black Autonomy Network Community Organization (BANCO), whose political work was utilized by the prosecution to convict him of these spurious charges. At present Pinkney is serving a sentence of 30-120 months in Marquette prison in the far northern area of the state, some 10-12 hours from his home in the southwest region of the Michigan. He is appealing the conviction in the state courts. Recently, Pennsylvania political prisoner Mumia Abu-Jamal issued a commentary entitled “Free Rev. Pinkney” in solidarity with the Michigan activist. She went on to recognize “some of the people who have lost their homes and are not with us today. Jerome Jackson is one.” Jackson, an African American living with disabilities, passed away in 2014 after long fight to save his home in Inkster, a suburb of Detroit. Cole also expressed concern for S. Baxter Jones, an anti-foreclosure activist whose Jackson County home was taken by Fannie Mae. Jones who was a co-recipient of the “People’s Spirit of Detroit” award, was arrested in July 2014 for blocking Homrich wrecking trucks that were heading to shut off the water services of Detroit residents. 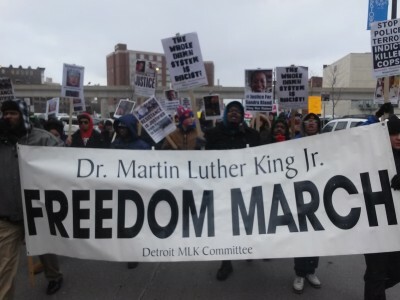 The Detroit MLK event is the largest gathering annually of progressive forces from throughout southeastern Michigan and is endorsed by a host of organizations and coalitions dealing with education, water rights, housing, police misconduct and other issues. Speakers and artists participating during the course of the rally and march also included: People’s lawyers Vanessa Fluker and Alice Jennings addressing issues involving housing and water rights; Elena Herrada, an elected member of the Detroit Board of Education in exile, still subjected to the emergency management of Michigan Governor Rick Snyder; Cong. John Conyers, who drafted and pushed through the federal holiday bill recognizing Dr. King which went into effect in 1986; two of the offspring of Detroit-based Civil Rights martyr Viola Liuzzo, Tony and Mary; Joe Mchahwar of Fight Imperialism Stand Together (FIST) spoke on the plight of the people of Syria and the role of the U.S. and Israel in the continuing oppression of the peoples of the Middle East; Melissa Mays of Flint whose pioneering work exposed the crimes committed by Governor Snyder in poisoning the children and adults of this industrial city, which now has become the focus of worldwide news reports; Amer Zahr, a Palestinian American writer and Adjunct Professor at the University of Detroit Mercy Law School explained the central role of Palestinian oppression in the political developments in the Middle East; among others. Music was supplied by Bobbi Thompson of Central United Methodist Church, the Director of the Deep River Choir. Additional singing was provided by the Flowtown Revue, a group of activists concerned about the massive water shutoffs in Detroit. After a more than two hour rally, a march was held through downtown Detroit walking pass several key locations: the 36th District Court to demonstrate against foreclosures and evictions; the Wayne County Jail to protest the mass incarceration of African Americans and other oppressed peoples; the Detroit Water and Sewerage Department (DWSD) in opposition to water shutoffs proclaiming that water is a human right; and through the financial district saying bailout the people and not the banks. Marchers returned to the Church for a community meal supplied by the Detroit Wobbly Kitchen where hundreds were served. A cultural program was then held coordinated by award-winning Poet Aurora Harris, a Broadside Press author and lecturer at the University of Michigan at Dearborn. Numerous artists, musicians and poets presented their works including: Wardell Montgomery, Joe Kidd and Sheila Burke Music, Wanda Olugbala, Jim Perkinson, Shushanna Shakur, Susan Sunshine, and many more. This annual commemoration which seeks to evoke the social justice and anti-war legacy of MLK, was founded in 2004 amid the early months of the U.S. invasion and occupation of Iraq by the Michigan Emergency Committee Against War & Injustice (MECAWI). By 2005, a Detroit Dr. Martin Luther King, Jr. Planning Committee was organized bringing in veteran Civil Rights activists along with youth and workers. 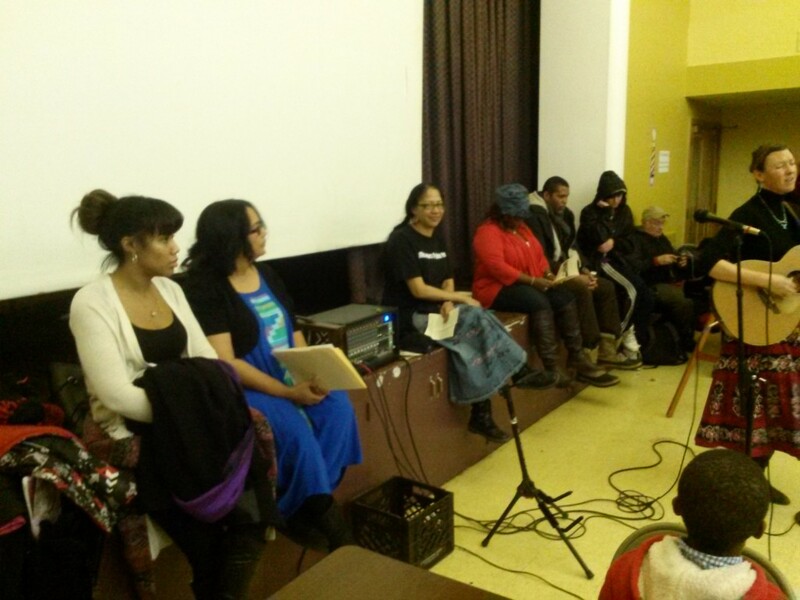 The event for 2016 was co-sponsored and endorsed by the ACLU of Michigan; Avalon Bakery; Detroit Eviction Defense; the Green Party of Michigan; the Moratorium NOW! Coalition to Stop Foreclosures, Evictions and Utility Shutoffs; Workers World Party; FIST; the League of Revolutionaries for a New America; the Michigan Coalition for Human Rights; Linda Szysko; Judith Quick Thompson; UAW Local 140 Civil Rights Committee; UAW Local 160; Veterans for Peace, Chapter 74, MI; Autoworker Caravan; Detroit Light Brigade; Dr. Gloria Aneb House; Jewish Voice for Peace; Metro-Detroit Coalition of Labor Union Women; the Pan-African News Wire; Sugar Law Center for Economic and Social Justice; The Truth Telling Project; Water You Fighting For; We the People of Detroit; National Boricua Human Rights Network; Michigan Welfare Rights Organization; the Jamaica Project; Huntington Woods Peace, Citizenship & Education Project; Advocates for Informed Nonviolent Social Change; among others.